Andros is the second largest and northernmost island of the Cyclades, but is still hardly ever visited by foreign holiday-makers. This is odd, as its tourist infrastructure is small but very exclusive. Andros is extremely lush and green for a Cycladic island, as it has plenty of water and, as a consequence, the most varied vegetation in the whole region. Pretty garden landscapes with cypress trees and lemon groves define the looks of Andros, but also steep and rough mountain ridges rising to a height of 1000m above sea-level. An island full of contrasts and once upon a time the wealthiest in the whole Aegean, Andros is nowadays only inhabited by ca. 10 000 people (in the 1950’s there were still almost 20,000 inhabitants). Amongst them are still some very wealthy ship-owner families – as the island has played a significant part in Greek shipping industry since the 19th century. This development into the base of a large merchant navy with its own dockyards was favoured by the island’s situation between the Greek mainland and Asia Minor. The crossing from the Harbour of Raffina to the unimportant but pretty little harbour town of Gavrio in the western part of Andros takes just under two hours. The capital of Andros – “Y Chora”, as the locals say – is situated on a bedrock in the east. There are rows of lanes with steps leading past Venetian towers and neo-classicist pastel coloured Patrician villas. Most of them are owned by the Greek “ship-owner aristocracy” but only used as second or third residence. Some of these houses can now be hired by tourists. On other Cycladic islands you will find debris and old building material, but on Andros every nook and cranny is sparkly and clean, in particular ‘Chora’ impresses with its atmosphere of dignity and taste. Incidentally, the town has been managed by women for many decades, as the men of Andros have been to sea, often as captains of ships, for the better part of the year – sometimes months on end, sometimes even years. Everywhere on the Cycladic Island you come across the glamorous names of famous ship-owner families from Andros. Even today, they provide the largest proportion of the Greek merchant navy, and signs all over the town proclaim which fountain, statue or square they have donated to the island. There is, for instance, the Empeirikos family or Mr and Mrs Goulandris, who gave the island of Andros one of the most exquisite museums of modern art – with famous works by Francis Bacon, Pablo Picasso and Henry Moore. The Goulandris family have always felt very close to their home island of Andros, even with their first residence being in Gstad in Switzerland and their trendy houses on Andros only being used as a holiday home. They still pay large amounts of money to make sure that their ‘home port’ Chora, is always presentable. In some cases these investments border on insanity … ship-owner Spyros Polemi, for instance, had a private lift installed from the jetty up to the bedrock, so he could get to his home in Chora unnoticed. Apart from the renowned museum, the island of Andros is very popular with artists; some contemporary painters and sculptors live here or have their workshops that they use for at least some part of the year. Despite the cosmopolitan clientele and the classy ambience, the Cycladic island of Andros and, above all, its beautiful capital have kept their Greek identity. The local sign-posts and those indicating cultural sites are usually written in Greek only. Although people of Andros like keeping themselves to themselves, they have not opposed international tourism and have no intention to do so. The beautiful resort of Batsi on the west coast offers a large number of places to stay and is by far the most tourist-orientated destination on Andros. The most beautiful beaches of Andros are slightly off the beaten track in the northeast of the island and are mainly accessible by car. But taking the trouble to drive to Levka, Vitali or Zorkos beach is definitely worthwhile. After the drive across the gravel tracks you are on your own. And from the bays you can see dolphins swimming in the sea around Andros. The pretty capital of the Cyclades Island of Andros is situated on a narrow promontory of the east coast. It is a wealthy town with numerous villas in classic style, most of them owned by millionaire ship owners. The second defining feature of the town are meticulously restored historic buildings from the Byzantine, Venetian and Ottoman periods. For a long time this beautiful town was not sacrificed to tourism – there was no need for tourism as a source of income – but even nowadays Andros is no place for package holidays. 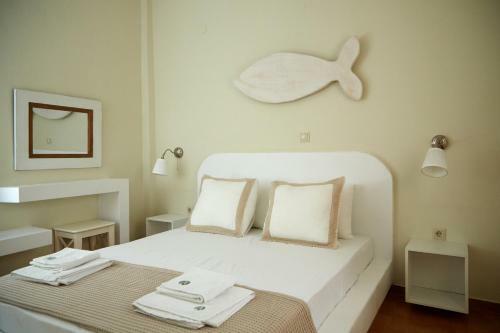 There is, however, mainly small scale and individual tourist accommodation available. The main road through the town centre is paved with marble and car-free. Guarded by a medieval city gate, the old town seems like a different world to the modern visitor. There are two very picturesque squares in Andros, one is lined with cafes, bakeries and restaurants, and a huge plane tree provides shade from the midday sun; the other one is located at the tip of the peninsula, with a stunning view of the town, the sea and the famous Venetian bridge leading across to a small island with a Venetian fortress. Not surprisingly, Andros Town is famous for its art scene, attracting many contemporary painters and sculptors who contribute to annual modern art exhibitions. On either side of the peninsula lie the beautiful bays of Paraporti and Neiborio with sandy beaches for sunbathing and swimming. In recent years, the quiet little fishing village of Batsi has developed into the main tourist resort on Andros. Its location in a beautiful bay and the proximity to several attractive beaches has made Batsi a favourite with tourists – the majority being Greeks from Athens who like to spend their weekends here. A lot of them arrive with their yachts or sail across from Lavrion Harbour on the mainland. Batsi’s ‘Platia’ is right next to the sea and has numerous pretty cafes and bars with colourful sunshades. Compared to other Cyclades Islands with less water supplies, Andros has a rich and lush vegetation, and the gardens on the island are brimming with flowers. Batsi’s marina leads to a lovely beach, and further south there are a number of sandy bays for those who prefer less populated beaches. Apart from its busy ferry port, Gavrion has remained a quiet and serene fishing village with a population of 800. Most tourists arriving at Gavrion Harbour are on their way to one of the more touristy resorts in the southern part of Andros. In recent years there have been developments towards a tourist infrastructure in Gavrion as well, with an increasing number of accommodation options, pretty cafes, taverns and shops. 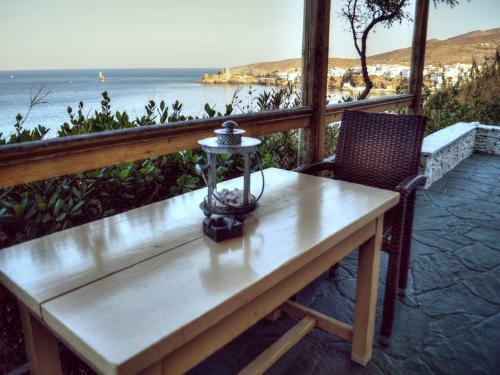 Gavrion is an ideal starting point for those who want to explore the authentic villages in the north of Andros and the solitary natural beaches in the north-east. There are interesting sights as well, like the tower of Agios Petros, formerly a watch tower guarding the island against pirate attacks or other intruders. Gavrion is a rapidly expanding tourist resort. The ancient excavation site of Paleopolis is located right in the middle of Andros’ west coast, not far from the beach resort of Batsi. For the duration of 12 centuries, Paleopolis used to be the island’s capital. Archaeological findings suggest that Paleopolis was a wealthy town, with several temples, an amphitheatre and a sizeable market place. From Paleopolis, enterprising visitors can walk down 1039 steps leading to the beach. Once they have arrived safely at the bottom, they can admire the remains of the ancient harbour and – sunken into the sea – parts of the agora, the assembly place of ancient Paleopolis.